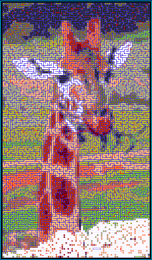 148 giant-sized PathPix puzzles based on the original 'Wizard of Oz'. Dorothy and Toto, the Cowardly Lion, the Tin Woodman, the Scarecrow, and more - all come to life as you solve. Complete book included. PathPix Color is the latest in the Max series, with 150 all new giant-sized puzzles in all the colors of the rainbow, including 20 puzzles based on famous paintings. Play PathPix on special grids with squares and rectangles of different sizes. Paths can be wild and wacky - use the new Check button to check your progress if you get stuck. 160 puzzles, Easy to Expert. Time's passing! Celebrate past, present, and future by playing PathPix! 99 puzzles, graduated sizes and difficulty levels, for today, tomorrow and the year to come. The original Alice comes to life as you puzzle your way through 42 truly gigantic, colorful, and FUN illustrations for Lewis Carroll's masterpiece novel, Alice's Adventures in Wonderland. Puzzles are based on the classic Tenniel illustrations. Complete book included. Live life on the edge - the PathPix Edge! No stodgy rectangles here. 180 puzzles in funny shapes and sizes from mini to supermax - more than half a million squares to solve! Lots of easy puzzles! Lots of medium puzzles! Lots of hard puzzles! Only a few real stinkers - just enough to keep you on your toes. Be thankful for all the little bits of joy in your life! Get 99 puzzles, small to large, Easy to Expert. Not the easiest, not the hardest -- 99 "just right" puzzles for the holidays and beyond. Be grateful every day of the year! Love great art? Like big challenges? PathPix Art has 150 GIANT-sized puzzles. Play puzzles based on works by Picasso, van Gogh, Monet, Chagall, Rembrandt, etc. Special SuperMax section with 18 of the largest PathPix puzzles ever made. By far the biggest PathPix puzzles ever -- 114 GIANT puzzles, over a million squares total! All you need is love - PathPix Love! Hearts and romance, whimsy and sentiment - it's a many-splendored thing! 99 puzzles, easy to extreme. Only 99 cents! Ghosts, vampires, scary things under the bed - PathPix Boo will keep you spooked with 99 puzzles, easy to extreme. Draw bright, bold lines of color to make paths connecting pairs of colored numbers. Finish solving to see the picture that you have painted. Wondering if PathPix is for you? Hooked? This is the next step, with 169 graduated levels, ranging from small, easy puzzles to large, advanced level puzzles. Relaxing and addictive! Are you an expert? Looking for a LOT of puzzles? Then PathPix Pro is for you, with 300 puzzles ranging from Medium difficulty to Extreme. Keep smiling! 99 puzzles = many happy hours of PathPix fun. Small to large, easy to advanced - you'll find it all here. Magic of all kinds! 99 puzzles, small to huge, easy to advanced. Lots more puzzles to tickle your funnybone. 202 puzzles, each with a silly joke or quote related to the puzzle picture. Small to large, easy to extreme. 99 puzzles with a Christmas theme to get you in the mood for the holidays. Whether you are looking for sentiment or silliness, you will find it here. PathPix for Windows PC includes 57 different puzzlepacks containing 1425 beautiful PathPix puzzles. These puzzles are all different from the puzzles in the various mobil apps. Wide range of difficulty from very easy to super hard.